Finally! 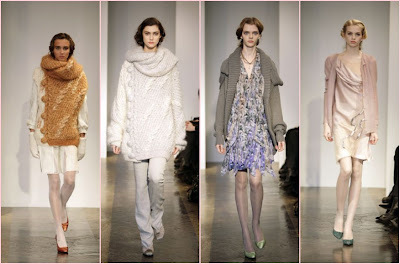 I've been waiting for Olivier Theyskens to show off his pre-fall 2008 collection. I'm quite a fan, so you get my impatience. Here's a selection of what I mostly appreciate. Extremely noticeable was the 30's influences in lenghts of skirts, shapes of dresses, the dusty color palette. I mostly like the massive sweaters paired with feminine dresses. These short dresses are just about to become a Nina Ricci characteristic. Sophisticated chic I say!